The Watchery offers free delivery on all orders. The Watchery offers over 20 brands like Fossil, Kenneth Cole, Rolex, Tag Heuer, Timex, Gucci, Citizen, Invicta, Movado, plus many more. The Watchery sources top watch lines from distributors around the world and bring great watches at low prices. The Watchery stands behind the authenticity of all its products. They are one of the top online watch sellers since 1997. The Watchery also sells pre-owned watches. All pre-owned watches are expertly restored with only original manufacturer parts and must pass a comprehensive 30-point inspection. Their pre-owned watch selection is updated weekly for the latest in superior pre-owned value. The Watchery also offers a money back guarantee if you are not satisfied with your purchase. Want a fancy watch, but don’t want to have to deal with shoppers and salespeople at luxury watch shops? Whether you’re looking for timeless Swiss and Finnish engineering, or modern designs from the ahead-of-the-curve Japanese, The Watchery gives you all the quality without any of the attitude, even if you want a diamond watch. The Watchery also sells performance watches optimized for high altitudes and even underwater settings. The Watchery offers an unconditional, 30-day, money-back guarantee on all watches. Have a question about a particular watch? The Watchery’s customer service specialists are waiting to take your toll-free phone call. You’ll be eager for passersby to ask you what time it is just so you can look at your new watch from The Watchery. Get an iconic timepiece for less when you shop with The Watchery online coupons. 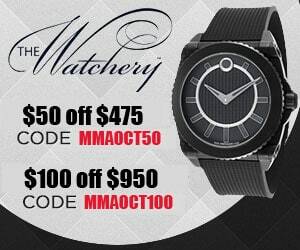 Use The Watchery Coupon for $50 off $475 with code MMAOCT50 or $100 off $950 with code MMAOCT100.